This brief article describes the work of this women's club, which was the largest suffrage club in the state. At their most recent meeting, the club members had signed a petition calling for women's right to vote. A group of the members then presented this petition to the state legislature. 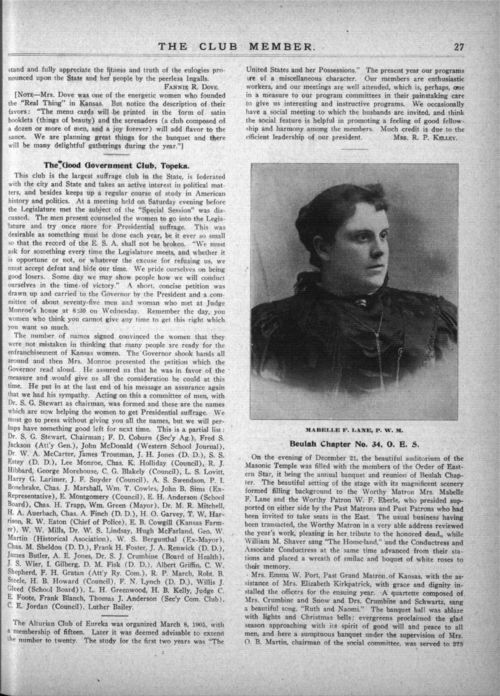 The end of the article also lists the names of Kansas men who supported women's suffrage; the names include such noteworthy citizens as George W. Martin and Samuel Crumbine. The petiton of the Good Government Club was unsuccessful. Women in Kansas did not gain the right to vote in national elections until 1912. This article illustrates the practical steps that women took to gain suffrage, such as petition drives and the formation of political clubs. It also demonstrates that leading men in the Topeka community were supporters of women's suffrage. This source could work alongside the photograph of Lilla Day Monroe, a member of this club.